A devoted servant of God, Metropolitan Roman Bernard fell asleep in the Lord on Wednesday, March 23rd after a lengthy battle with cancer. With great sorrow, Metropolitan, Archbishop +Michael from St. Seraphim’s performed the burial rite for Metropolitan Roman on Monday, March 28, 2005 in Ohio. Metropolitan Roman was more than just a Spiritual Shepherd to our Diocese; he was a storehouse of information about Orthodoxy, and a father confessor to many. 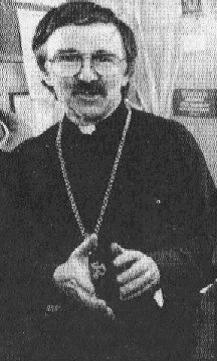 A Bishop for over twenty-five years, Metropolitan Roman served The Orthodox Catholic Church of North and South America with great compassion and diligence. Mere words are not sufficient to express the gratitude of everyone in our Diocese for his unselfish, loving, and compassionate guidance over these past twenty-five years. He will certainly be missed, but never forgotten. May his memory be eternal. 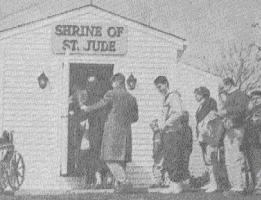 The Shrine of St. Jude as it appeared in 1992 when the Icon of the Holy Protection miraculously wept.